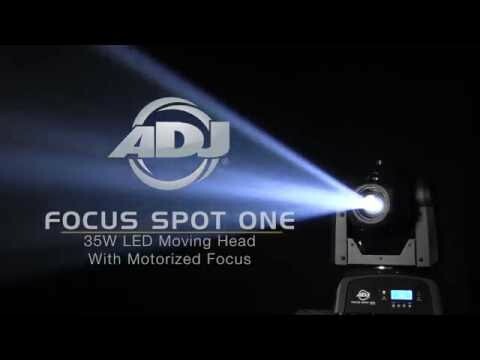 New American DJ Focus Spot One, high powered 35 watt LED with motorized focus, one rotating gobo wheel, one color wheel, gobo indexing, EZ Gobo replacement, built-in 3 watt UV led, DMX, built-in programs, sound active and UC IR compatible. • Weight: 10.5 lbs./ 4.7 Kg. 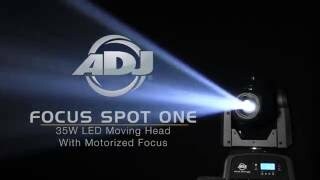 Considering purchasing the American DJ Focus Spot One? Have questions? Ask people who've recently bought one. Do you own the American DJ Focus Spot One? Why not write a review based on your experience with it. Seen a video for American DJ Focus Spot One online or have you own video? You will earn 1,836 loyalty points with this product worth £4.59, when logged in. Check out American DJ Focus Spot One on DJkit.com!